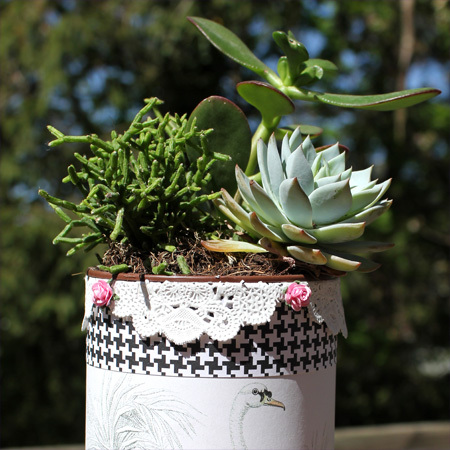 Mother’s Day is right around the corner and here is a little project that you can make in a snap…add a pretty plant or flowers and viola a great little hand-made gift. Do you have 15 minutes? 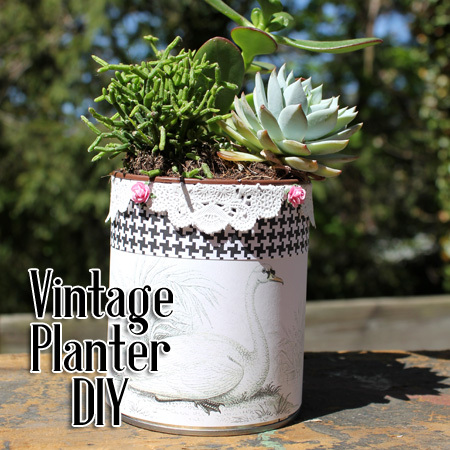 Well that is just enough time to make a Vintage Style Planter. 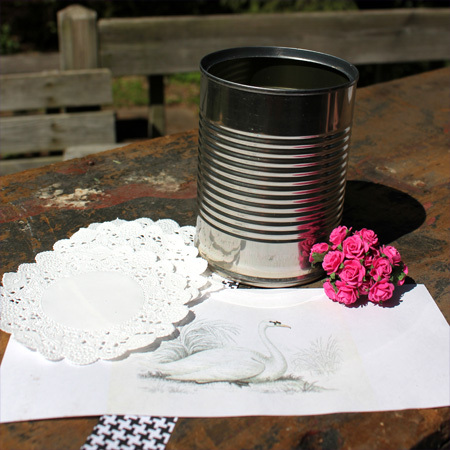 All you need is a clean tin can of your choice, a beautiful vintage image (I used the vintage swan) but as you all know…there are tons and tons of options here a The Graphics Fairy to choose from. You will have to run out your image to fit the size can you are using. 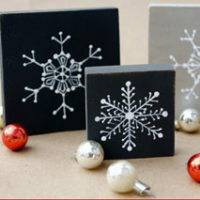 Some paper doilies, a nice border strip of complimentary card stock, some embellishments and glue of your choice. I used a spray adhesive for the wrap and hot glue for the band, doilies and embellishments. 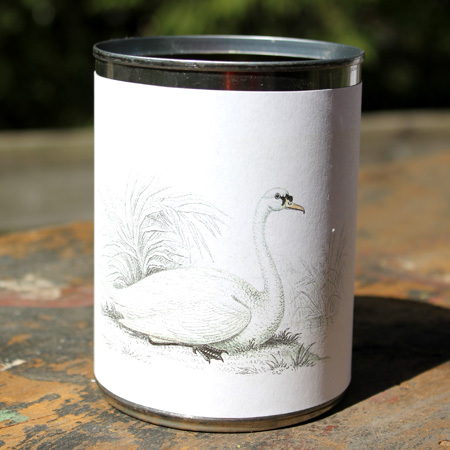 Now with the glue of your choice adhere the image wrap around the tin. Apply the card stock border. 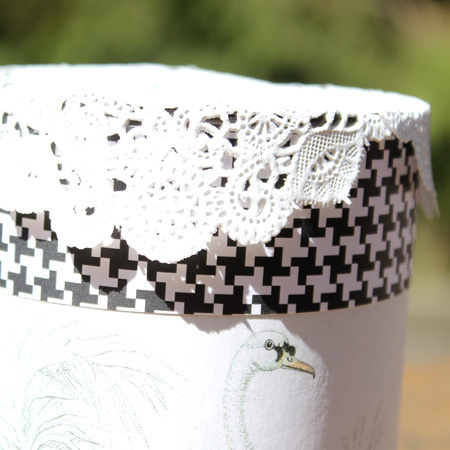 Then fold your doilies to the size your prefer and tack them on both sides of the can and then repeat. 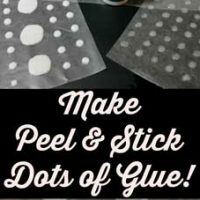 Now you can apply your embellishments with hot glue…they hold everything in place and gives it a little POP! Add your plant and a card and your gift is complete. 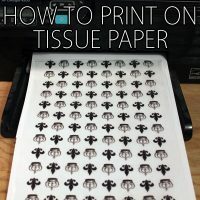 So easy…so pretty and you can use the can for so many different things. Why not do one in a kitchen theme and add wooden spoons to fill it up…Mom would love that. Perfect for pencils and the list goes on. Kids will love this too. Create and Have Fun!!! Thank you Karen for another great Upcycle! Gracias por la idea, es una maravilla!!! 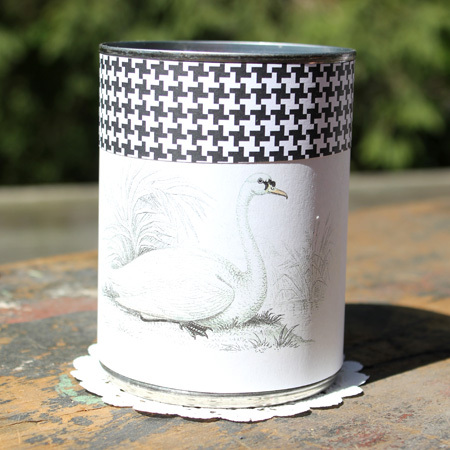 I love upcycling tin cans. 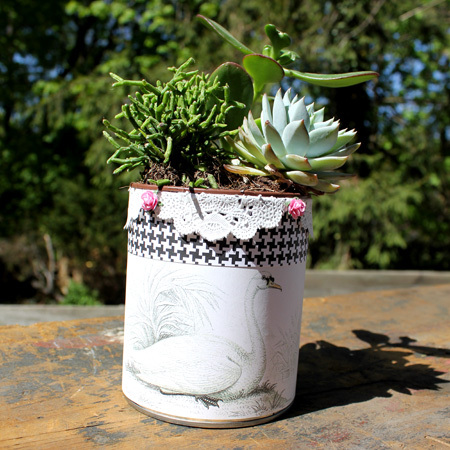 Your tin can planter is adorb!